Whenever J and I make a meal, you can bet that, in most cases, at least four of the five ingredients above are featured in some way or another. But in one of our newest refrigerator staples, they are the stars. Helloooo, soffritto, you sweet, jammy medley. We had our first encounter with soffritto over the holidays last year, following the recipe from Thomas Keller’s “Ad Hoc at Home” cookbook in the ever-engaging “lifesavers” section. His is a simple recipe, really: Finely dice onions (3 cups) and combine in a large pan with olive oil (1 cup, though I sometimes us a bit more so there is more to save) and a bit of salt. Bring the oil just to a boil, then reduce the heat and place the pan on a heat diffuser. Simmer for 2 1/2 hours. Cue the tomatoes. Keller gives instructions for halving one pound plum tomatoes lengthwise, and grating the flesh on a box grater until only the skin is left in your hand. I did this once. But in December in the Northwest, plum tomatoes are pretty anemic. And while the process of hand-grating tomatoes is not difficult, I feel it’s not entirely necessary when a box of good-quality Italian crushed tomatoes is a fine shortcut. 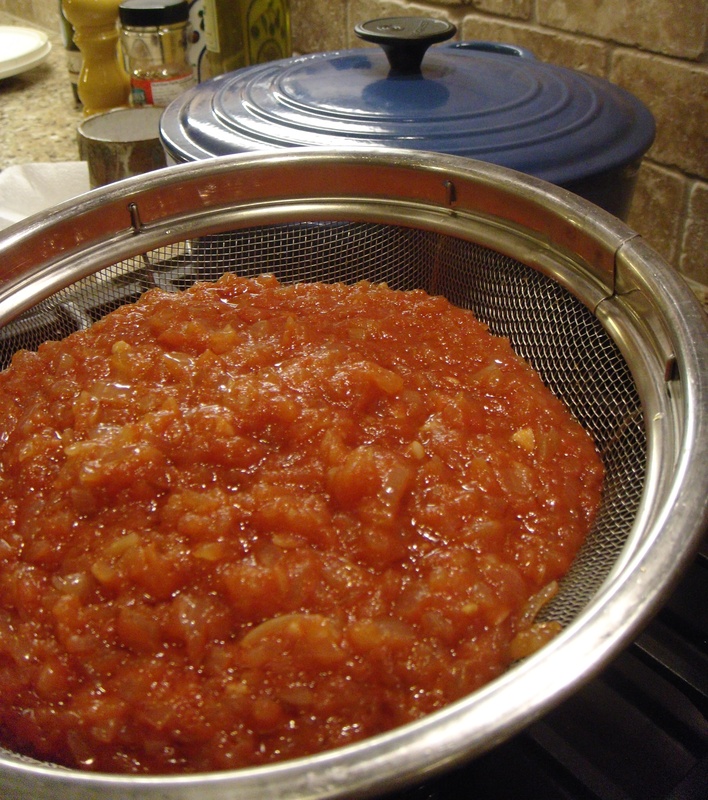 Add the tomatoes (1 cup or so) to the onion/olive oil stew, give a stir and simmer for another 2 1/2 hours. Low, slow. Remove the pan from the heat, add one or two (Two! No, three!) minced garlic cloves and let the mixture cool on the stove. Use a fine-mesh sieve to drain off the extra olive oil, reserving it for the next batch of soffritto (Keller’s advice), or for sauteeing vegetables (our advice). Either way, refrigerate the oil, refrigerate the soffritto. Enjoy. How to enjoy? I eat my fair share of quesadillas, and this mellow-sweet, onion-y condiment is a luxurious topping. It’s also delicious on frittata, fish or pasta. I would put some on my omelette. with melted cheese maybe. mmmmm. pass the soffrito please. Yup, would be awesome. Oooh, oops. Drooled a little thinking about it. All the ingredients that I love. I’ll do it tomorrow. I can think of 100’s of ways to use soffritto. Thanks.